I tested the shades Subtle Coral and Designer Blossom. Subtle Coral is a very natural, peachy pink. The colour is pretty close to the natural hue of my lips but slightly glossier. Designer Blossom is a berry red that isn't too vivid and leaves a nice stain on the lips as the day goes on. This shade is a fraction less hydrating than Subtle Coral but it isn't overly noticeable. Overall I was very impressed by these pen sticks. The pigmentation is great for day to day wear and you aren't left having to reapply these constantly throughout the day. I'm tempted to pick up a few more of these colours when they land on counters, in particular the brighter red. 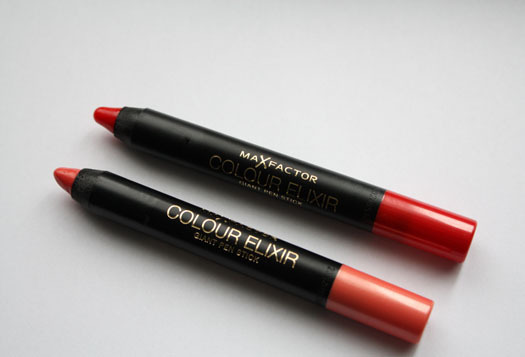 Draw between the lines, add some colour to the lips and some sparkly eyeshadow, I won't tell anyone you're not wearing lipstick if you won't..
♥ Max Factor's range of Colour Elixir Pen Sticks are available from this month at Farmers, Kmart and select Pharmacies. Great review S! You make me want to try these. You should Hannah! They're fantastic. I don't think they've been released yet. Hopefully it's soon x.